Ravichandran Ashwin is a rising star of Indian Cricket who has entered in to Test cricket with a bang and has shown his potentials as an all rounder in the recently concluded Test series against the visiting West Indies. Ravichandran Ashwin was handed over Test cap forIndia on November 6, 2011, at Feroz Shah Kotla Stadium, New Delhi. The young all rounder did not let down national selectors and was adjudged ‘Man of the match’ twice in the series and also declared ‘Man of the series’. Ravichandran Ashwin was born on September 17, 1986, in Madras(Chennai), a right arm off spin bowler and right hand lower order batsman. He has played forIndia, Tamil Nadu Under-14’s, Tamil Nadu and Chennai Super Kings. The 25-year-old started his cricket in the streets of Chennai and caught the attention of the local selectors and represented his home side under-19’s and then on the senior level as well. He was declared ‘Player of the series’ in the Indian Premier League 2010, held inSouth Africawhile representing Chennai Super Kings. The youngster won the hearts of Indian selectors and made his debut for Indiain One Day International match against Sri Lankaon June 5th, 2010, at Harare Sports Club, where he scored 38 runs and got two wickets as well. Ashwin has played 21 ODI’s and has grabbed 35 wickets at an average of 24.57 runs per wicket with the best of 3 for 24 runs. He has scored 123 runs averaging 17.57 runs with the best of 38 runs which does not reflect his true potentials as a batsman. The right arm off spinner started his international Twenty20 career against Zimbabwe on June 12, 2010, at Harare Sports Club and took one wicket in the match whichIndiawon by six wickets. Ashwin finally got the chance to represent in the longest version of the game forIndiaon November 6, 2011, at Delhi against West Indies. He got three wickets in the first innings of the Carribeans, their batsmen found it hard to read him in the second innings and the young chap flew away with six scalps. 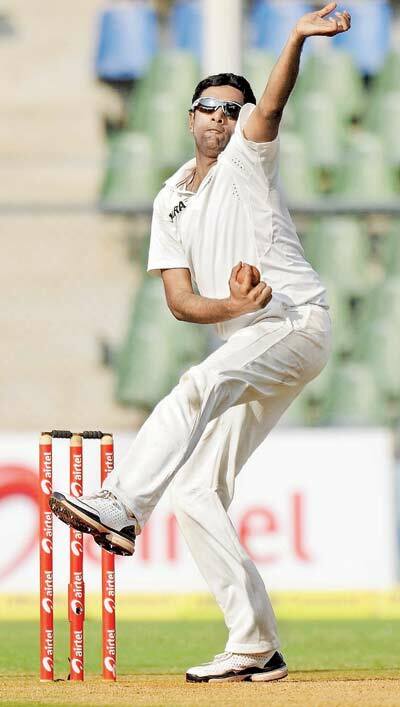 Indiawon the match easily by five wickets, it was an ideal start for him in Test cricket and his match winning performance earned him the honour of ‘Player of the match’. Indiawon the second Test against West Indies comprehensively by an innings and 15 runs on November 17, 2011, at Eden Gardens, Kolkata, where he picked four wickets. The third and final Test of the series was played at Wankhede Stadium, Mumbai, from November 22 to 26, 2011, had a nail biting finish and happened to be the only second match which ended as a tie in Test history. West Indies have the honour to be the only team in the world who is involved in the both encounters as the previous tied Test was played against Australia from December 9 to 14, 1960, at Brisbane. Ashwin once again proved his worth in the Indian team as he grabbed five wickets in the first innings of West Indies in the third Test. He went on to score 103 runs when it was required badly and chipped in with four wickets in the second innings. It was the second time when the all rounder was declared ‘player of the match’ and more than that he emerged as ‘Player of the series’ as well. Ashwin has become a threat for all the batsmen of the world, his bat can deliver runs when required and he is ready to continue with the match winning performance for India. He is still young, give him some time to mature. All rounders are not born, they are made.